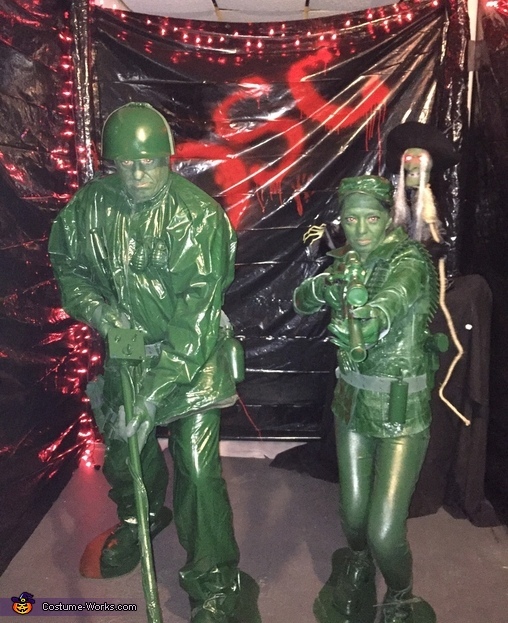 My husband and myself are wearing our creative costumes, I always wanted to try and become a toy so this was perfect. We just went in our closet and grabbed a old pair of shoes and rain coat for husband I used an old jacket and leggings, we bought several cans of primer spray paint and gloss green hunter spray paint, we used the primer first let it dry and used the green all over everything one a time of course, we looked through our sons toy guns and spray painted it also went to thrift store found a helmet to paint along with other gear to complete costumes. I would recommend getting all your spray painting a week or two before going out wearing it because we smelled like paint all night, but it was fun and we had so many compliments. If any questions about the costume feel free to ask.